Order Now and we'll have your card printed and mailed in one business day. We will print, address, stamp and mail your card for you in 1 business day! Don't worry! We have the address for the funeral home & the family on file. If you're not happy with your card we'll send a replacement or refund your money. What would you like to do? 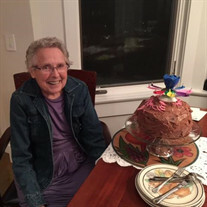 The family of Elaine Oakley Hampel created this Life Tributes page to make it easy to share your memories. A comforting word from you means a lot. Send flowers to the Hampel's family. © 2019 Alhiser-Comer Mortuary. All Rights Reserved.